I thought I'd post extracts from the book throughout the week in order to give you a flavour of the book and how it shapes up. 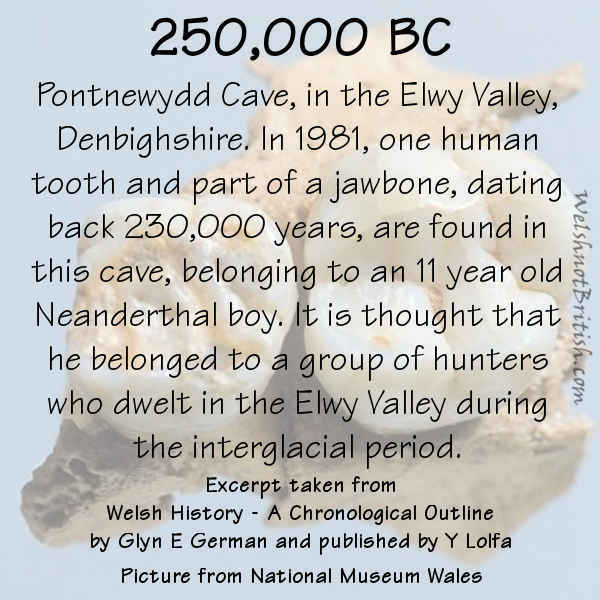 The first chapter details the earliest human remains found in Wales which are now housed at the National Museum Wales. It mentions other people to have made their home here, ice ages, The Red Lady of Paviland and the abandoning of Wales due to the extreme drop in temperature. As I said in the introduction the book is concise and this is shown immediately with just under three pages detailing half a million years. The chapters do become longer the further in we go due to the increase in evidence found and the small detail of history being recorded by the people who were there at the time. Right from the start you'll see little numbers after certain pieces of text which are backed up with an explanation in the end notes which comprise a dozen or so small type pages. This is then followed by an index (or who's who) of people mentioned in the book and the years where they are mentioned. After that we have a bibliography and finally a list of websites for further research. Chapter 2 takes us from around 11,000 BC until just after AD so we're looking at mesolithic, neolithic, bronze and the beginning of the Roman age. We also find out about Celtic incursions across Europe and Europeans coming to Britain which leads us nicely into chapter 3 where the action really 'livens up'. Maps are included to show the different Roman territories and the areas later controlled by the Saxons and also some poems from the time, both in Welsh and translated into English. The next excerpt I'm going to include is from chapter 4 and is about Vortigern, it's a great example of how concise (there is that word again) the book is. In a few sentences we learn a little about Vortigern and what it means. 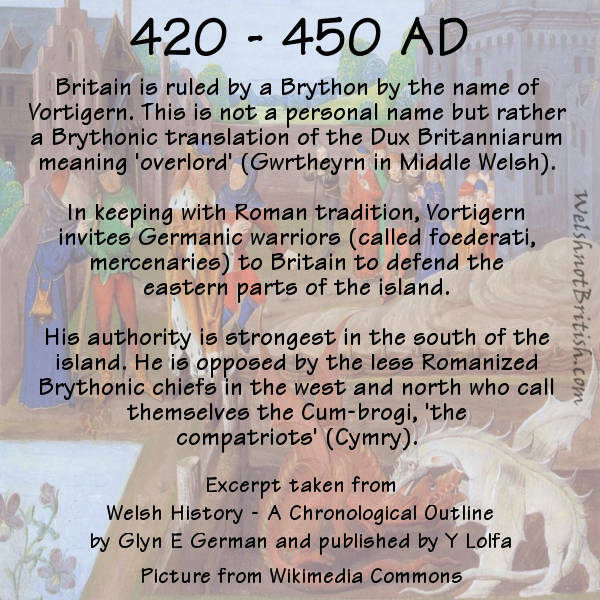 The Germanic tribes and how they came to inhabit what is now England and of course the history and meaning of the word Cymry. The book has a foreword from a former chief of the Welsh exam board (WJEC) and he notes how useful the book would be to people of all ages especially those in education. In school I learnt about the Romans, Normans and Vikings, nothing about the periods before or between and nothing about the devastating impact the invasions had on the people who were here before them. I wonder how much it would cost to give this book to every child in Wales? Chapter 5 is titled as the Viking Age but it features a hell of a lot of information about the Welsh rulers and saints of the time and their battles not just with the Vikings but also the Anglo-Saxons. There's poems and family trees included. The first tree goes from Rhodri Mawr all the way down to Llywelyn ap Gruffudd and the second from Owain ap Hywel Dda down to the Tudors. These are very welcome additions and make it far easier to see how they were all related. If you've ever watched the Godfather trilogy with a family tree or Game of Thrones with a map then you'll realise how much clearer these diagrams can make understanding the story. There are so many highlights in this chapter that it's hard to pick one thing to use as an excerpt. I've decided to use the Armes Prydain Fawr. And as an added bonus (more luck than judgement) it ties in nicely with the previous excerpt as it mentions Vortigern and the Cymry. The book has the original in old Welsh followed by the English. Chapter 5, 6 and 7 deal with the Normans. It's only really from the late 14th century where the book refers to the people of England as English. That's over 300 years after the Normans conquered England. I make that around 12 generations of people born and bred in England but not being referred to as English. It's a minor annoyance but it's one that has pervaded our history books for centuries as an easy way for the English to deny culpability when it suits them. The book does include an editorial explaining this (which he later contradicts) but it appears to mainly be down to language which is bizarre on two counts. Firstly if language dictated nationality then the majority of Wales (not to mention the USA, Australia etc) ought to be described as English, probably best not to try this in The Valleys or it would start a war. Secondly, the author acknowledges that only 5-10% of them (the top brass) actually spoke French whilst the rest spoke English as they had done since before the Normans conquered England. Aside from this issue it's nice to have this period from a Welsh perspective. The chapters also contain examples of infighting and betrayal amongst the Welsh rulers and references to the great books that were redacted in this period. Chapter 8 is the one we've all been waiting for and yet simultaneously dreading because we know it's all downhill from here on. It covers just 13 years but it's probably the most exciting 13 years of Welsh history. It is, of course, the uprising of Owain Glyndŵr and the next excerpt I'm going to pick might just explain why so many people flocked to Owain's side. The laws passed would, if passed today, be classed as apartheid. Chapter 9 deals with the end of the Hundred Year's War as well as the War of the Roses whilst 10 and 11 deal with the Tudors and the Stuarts. For me these periods are some of the most boring (and depressing) aspects of Welsh history which means a book like this is good as it just gives you the key points meaning there's very little point skipping ahead. 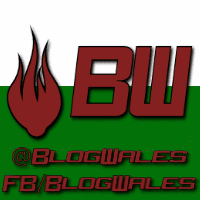 Chapters 11 and 12 deal with the rise of Wales as an industrial nation and the labour movements that came about due to the unsafe and exploitative working conditions of the time. Various riots and uprisings are mentioned but when dealing with Dic Penderyn it feels strange that the most important pieces of information are missing. Dic was executed for a crime he didn't commit which was the stabbing of a soldier. An extra sentence is all that would be needed to explain this. The next excerpt I've chosen is to do with the blue books and it once again references Vortigern by mentioning The Treachery of The Long Knives some 1400 years previous. 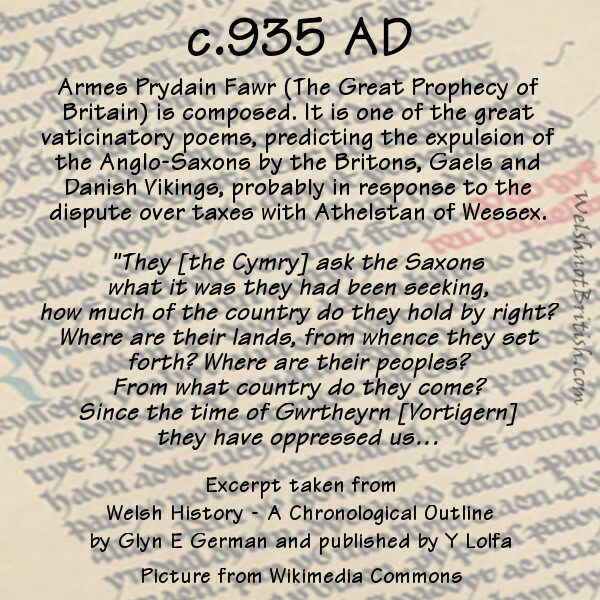 It's also almost a thousand years since the extract above mentioning "Since the time of Gwrtheyn [Vortigern] they have oppressed us". We're now into the home stretch with chapter 14 dealing with the World Wars, Chapter 15 dealing with the rise of Welsh identity and the 16th and final chapter dealing with Wales after devolution. 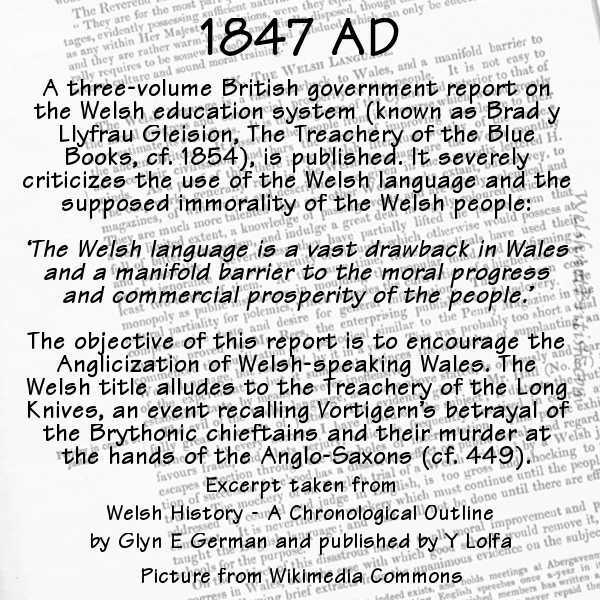 One thing I found very odd, given the amount of space given to the decline of Welsh speakers with the use of census data and maps for the given years, the author chose to mention the Welsh Not very late (1910s) when he had already mentioned the reports of the Blue Books (which referenced the Welsh Not). When it is mentioned there is no mention of the punishment for wearing it. You could imply from this that simply wearing the Welsh Not was the punishment as opposed to having a damned good hiding. Another glaring anomaly is the omission of Tryweryn. Considering the huge impact this had on Wales' political awakening and the protests in Wales and Liverpool you'd think it would get a mention. Sometimes the omissions are in what is included but not explained in enough detail. Aberfan gets a mention but the negligence is left out. The same is true for other mining disasters that are mentioned such as Senghenydd. All this is especially strange considering the editorial added at the start of the chapter. The final excerpt I have chosen is from this editorial. Apart from the obvious fact that including 'the arrival of the English in the 5th Century' means the editorial contradicts the earlier editorial it is a strange way to frame the chapter given the omissions I have mentioned above and below. The Free Wales Army get a passing mention and even then it's vague. Tryweryn, Aberfan and the coronation of an English prince could all have been covered better if the Free Wales Army (and other groups) had been included in more detail. There's an inclusion of the arson attacks on English owned holiday homes which ends in the most bizarre way. After a paragraph detailing the length of time and number of attacks it states "Between the 1960s and 1990s hundreds of protestors are imprisoned for various offences." This last sentence is very misleading as it implies there were hundreds of people imprisoned for burning down English holiday homes when the truth is that no one has ever been convicted for the arson attacks and former Plaid Cymru MP Elfyn Llwyd believes it was MI5. At best it's sloppy at worst it's deliberate misinformation and helps spoil what is otherwise a good book. The way the chapter is written does bring to mind Meic Stephens description of the history show 'The Dragon has two Tongues' in which he states that the belief in who won the debate between Welsh nationalist Gwyn Alf Williams and British nationalist Wynford Vaughan-Thomas is what separates the goats from the sheep. Unfortunately this chapter appears more sheep. The last but one entry in the book is about Bale's transfer to Real Madrid. I mention it because once again a glaring omission is made. I'll post the original text and add a few words in bold just to show how easy it is to improve upon the original. 2013: Welsh footballer Gareth Bale (born in Cardiff) is transferred from Tottenham Hotspur to the Spanish club Real Madrid for a world record of €100 million. For those, like myself, who will use this book as a reference point to look up events in more detail it is a great addition. I do worry though that some of the issues I have with the events I have commented on above (and below) are replicated in other parts of the book and I have missed them because they are not as common knowledge as ones I have picked up. Here are a few more examples that stand out. Henry Morton Stanley is mentioned but there's no mention of how disgusting a person he was. The Tudur brothers are said to have attacked Conwy castle on Good Friday but it was also April Fools Day and they gained access to the castle by pretending to be carpenters. That little titbit is worthy of inclusion simply because it is so funny. Dafydd ap Gruffudd's execution is included as a footnote after the events of Cilmeri but surely the manner of his execution and the reason for the brutality are worthy of inclusion? Another glaring omission from this era is that the royal children were all either murdered or imprisoned in order to prevent heirs to the Welsh throne being born. 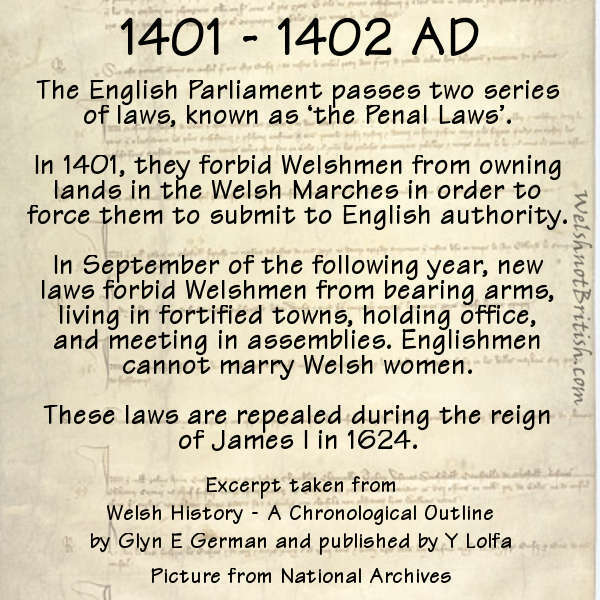 A few years later the English stole the title of Prince of Wales for themselves and have used it ever since. To me this is the Tryweryn of the era and yet, as with Tryweryn, it is missing from the book. It is omissions like this that prevent a good book from being a great book. Perhaps there will be a second edition released that can correct some of these glaring omissions? The book is definitely a bargain at £7.95. 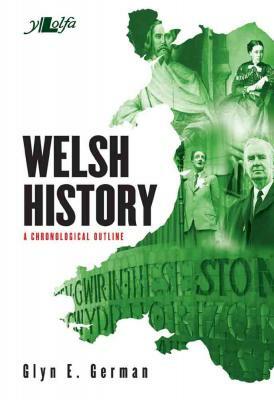 If you have even a passing interest in Wales or Welsh history then it is certainly worth getting hold of. 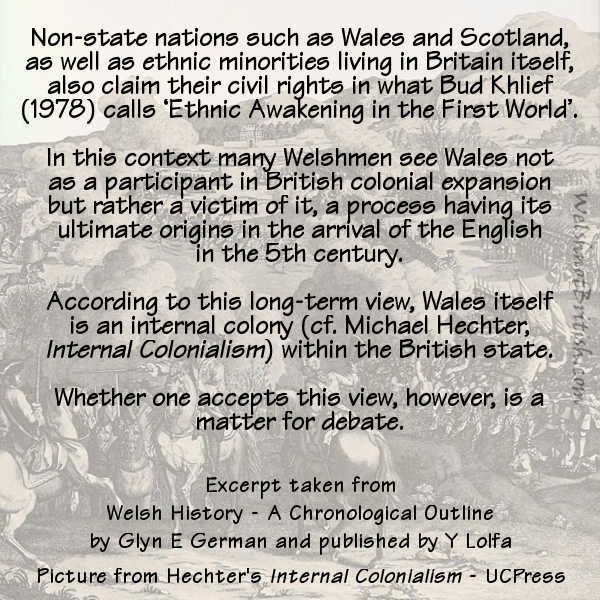 I'm giving away one copy of Welsh History - A Chronological Outline by Glyn E German for one lucky reader. In order to enter simply leave a comment below, make sure you use your email address so that I can contact you for your postal address. I will then purchase a brand new copy and have this sent directly from Y Lolfa (the publishers of the book). The competition is now closed. I have taken all the entries, copied them into a spreadsheet and then used a random number generator to eliminate entries one by one in a 'last man (or woman) standing style competition'. I will now email the winner. After emailing the winner I will give them one week to supply an address before selecting a new winner. Good luck and please note that I will not be doing anything with the email addresses other than contacting the winner. Feel free to use a disposable account if you would rather. Edit - The mobile version of the site isn't displaying the Disqus comments system it is displaying the stock blogger comments system (no idea why). So if you are viewing on a mobile device try viewing the web version. I will include entries on either system but long term I'll have to sort this out. Also some comments on the Disqus system aren't showing up so I have asked them to comment again after I made a few changes. I've got email copies of all the entries so don't worry about that. It'd just be nice to easily show all the public entries. Hopefully all the teething problems are now sorted out. If you'd rather just buy the book then you can get it via Y Lolfa's website for £7.95 with free delivery anywhere in the UK.